Get ready for some company, tea tree oil and jojoba oil: I’m ready to induct another natural beauty product into my acne-fighting hall of fame. Zum Rub Moisturizer in Frankincense & Myrrh has been my go-to nighttime acne treatment of choice for the past two weeks, and I’ve experienced some phenomenal results. First, frankincense, like tea tree oil and lavender, is known for its antifungal properties as well as its astringent and anti-inflammatory benefits. Myrrh, frankincense’s usual partner in acne-fighting crime, has these same properties and is most well-known for its ability to treat wounds. These two complexion-clearing oils come together in an amazing base of sunflower seed oil, grapeseed oil and coconut oil to create a light moisturizing treatment that stopped the onset of a cystic acne pimple on my chin. Typically, when I feel an under-the-skin pimple forming, I can do nothing more than dab tea tree oil on it every night and hope for the best. I’ve never successfully prevented a cystic pimple from forming with this approach, but I’ve usually been able to keep it from becoming infected. However, when I used the Zum Rub Moisturizer in Frankincense & Myrrh liberally on my chin when I felt the beginning of the cyst forming, it took just three days of continued use to go from a small knot under the skin to nothing at all. The cystic pimple never ballooned up in size and caused that painful, unsightly bump on my face. 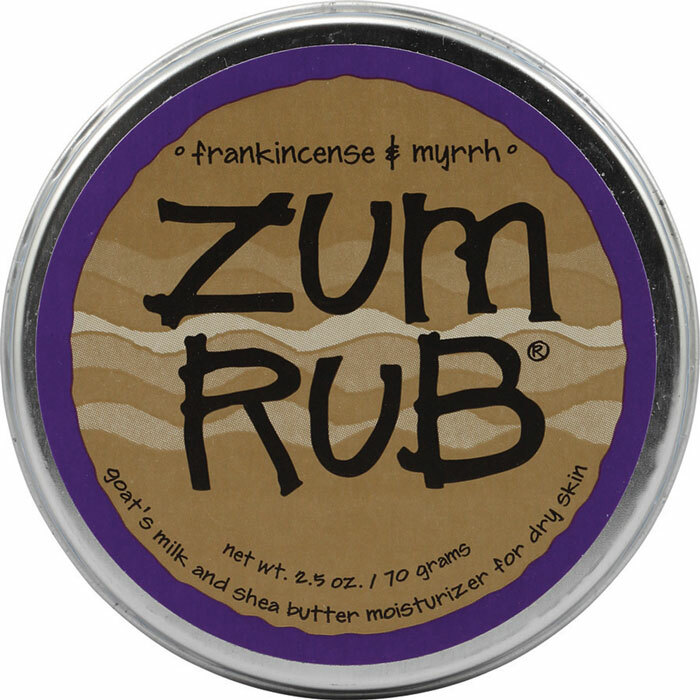 In addition to stopping acne flareups in their tracks, I like that Zum Rub Moisturizer in Frankincense & Myrrh is one of those inexpensive, easily accessible, multipurpose products that just happens to made right here in Kansas City. Points for being a local! It also wins skincare points with me because though I tend to be a pure oil addict when it comes to skin moisturizers, I like that Zum Rub Moisturizer in Frankincense & Myrrh basically just solidifies (thanks to coconut oil, beeswax and shea) my favorite effective skincare oils, like grapeseed oil, into an easy-to-apply, no-mess skin treatment that works. Certified organic sunflower oil, grapeseed oil, coconut oil, beeswax (natural, not refined or bleached), carnauba wax, shea butter, goat’s milk, essential oils, fragrance oil & vitamin E.
The only drawback to Zum Rub Moisturizer in Frankincense & Myrrh? Your nose may not love the scent. I find the aroma of frankincense and myrrh quite soothing, though; it’s a woodsy sort of spice that reminds me of a morning hike and lots of fresh air. If you’ve got problematic skin, I think you should give Zum Rub Moisturizer in Frankincense & Myrrh a try. Report back and let me know how it works for you! Have you found any holy grail, natural acne treatments? Please share them in the comments section!